Awin has developed a number of tools with its tracking and interface to help publishers optimize their affiliate campaigns and make money online through affiliate marketing as easily as possible. Awin's interface and reporting allows every user visibility on a range of data points across each of the advertiser brands they work with, including cross-device tracking, order value, click-to-sale lag time, new and existing customer split, and influence contribution, showing how many sales you've had a touchpoint in but not secured the last click. With easy-to-integrate tracking and tools, Awin's tracking solutions ensure all referrals get tracked for affiliates to earn commission. MyAwin is Awin's browser extension for Google Chrome, designed to make creating and adding affiliate links on the fly as quick and simple as possible. By downloading the Chrome extension, a button will be added to your browser toolbar. When landing on an advertiser site, the button will offer several simple actions, including joining an affiliate program if you're not already connected to the advertiser, quickly generating shortened tracking links and ‘one-click’ share links on Twitter, Facebook and Google+, generating custom URLs and generating links to specific product pages. Opportunity Marketplace is a tool that lets publishers list, manage and promote all of the advertising options available on their website. These listings can then be viewed and considered by Awin advertisers in an easy-to-use directory. The listings allow publishers to showcase the demographic audience they reach, the sectors they are active in, the types of promotional opportunities they are able to offer, as well as the commission models they are open to working on. Opportunity Marketplace also facilitates easy communication between advertisers and publishers, should you wish to discuss any opportunities in further detail before agreeing. Advertisers are able to view all opportunities posted to Opportunity Marketplace, so the directory serves as a location to showcase your publisher website to advertisers whose programs you might not already be promoting. 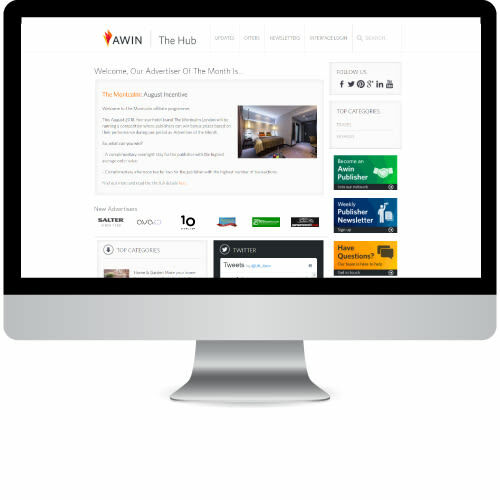 The Hub is Awin's offers portal, where advertisers post their regular updates regarding most popular offers each week and any key product focuses, as well as sales messaging and new campaign launches. The Hub is browsable by all publishers and allows each publisher to see the offers available across the network. Each post is linked to the advertiser's profile page, where you can sign up to the program if you're not already, as well as provides tracking links that can be added to a publisher website to promote these key offers.